I’m always horrified when I hear keepers admitting to poo picking their coops everyday in order to keep them clean. 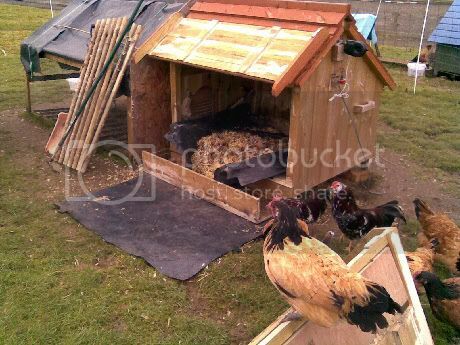 While this might be sustainable with one house to look after and half a dozen birds or less to worry about I have four and sometime five houses with 8 to a dozen birds in each house and poo picking just isn’t an option. 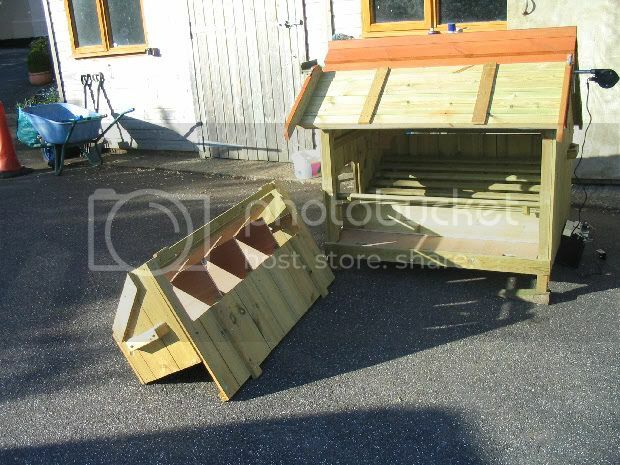 However it’s not necessary either with proper house design you can reduce the average clean time to just 3 minutes per week and have perfectly sanitary conditions for your birds. The object of any cleaning regime is to separate the dropping from where the birds have access so they aren’t constantly walking and picking in their own droppings. The trick is to emulate what would happen naturally. 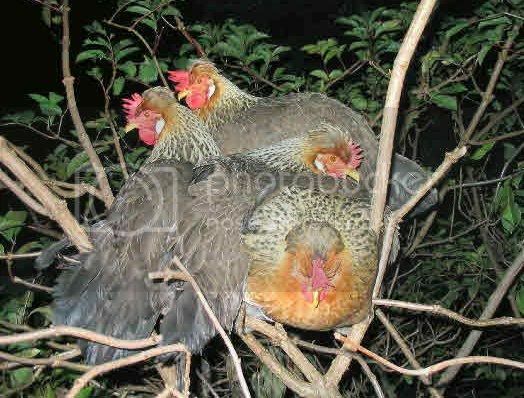 Chicken naturally roost in tree branches and their droppings fall through the branches onto the ground so they aren't exposed to a heavy build up. This situation can be emulated in a house by having roosts which consist of a grid of parallel roosting bars with gaps in between for the droppings to fall through. Bar width of 5cms with a gap of 5 to 6cms works well. 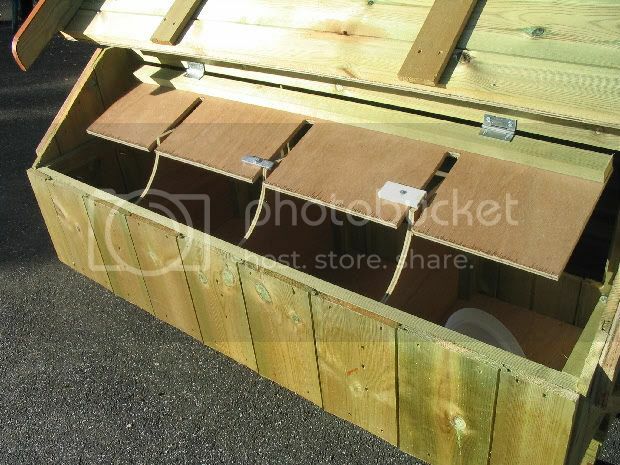 The roosts should be mounted above a floor to which the birds have no access and so can’t pick in them. 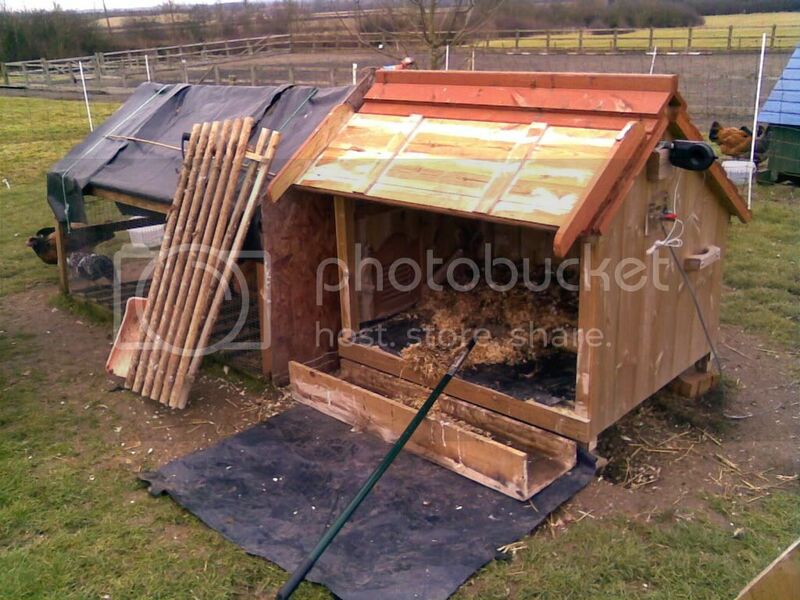 There needs to be enough room under the roosts to allow a build up of droppings of around 12cms or so. 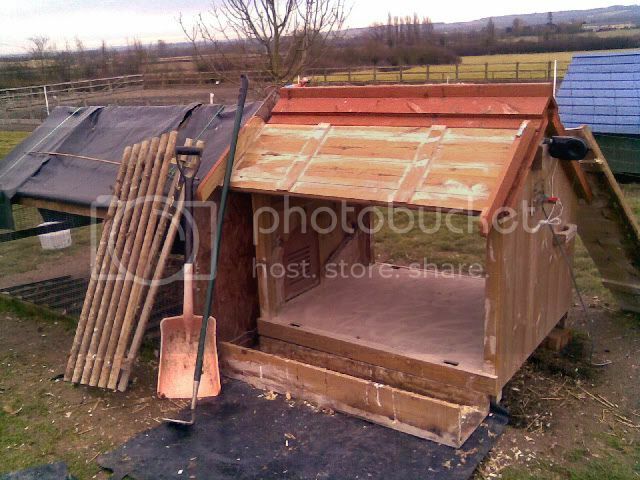 You can then use an old poultry house system called deep litter where the litter is built up by top dressing the soiled litter with a new layer of clean litter so the surface stays substantially clean and dry. In a deep litter system the litter is allowed to build up over the course of a laying season and just dug out once a year. I don’t advocate doing that for a small hobbyist house but allowing a build up over a 4 to 8 week period (depending on occupancy and build up) is perfectly possible between complete litter changes. Obviously with this system you need to ensure that the litter remains as dry as possible and that adequate ventilation exists to prevent any ammonia problem but neither should be a problem. Designing the house with plenty of access and a perfectly flat floor reduces the time for a complete cleanout to little more than 12mins or so. When top dressing with clean softwood shavings or Hemcore I empty the shavings in the nestboxes out into the house floor adding a few handfuls of clean litter if necessary to complete the top dress and I then put clean shavings in the nestboxes. Closing the nestboxes in the evening and opening in the morning prevents the hens roosting in them and eventually they are trained not to. I use a house which supports all these features the Forsham’s Lenham design shown below. To this house I add an auto pophole opener and closer of my own design which costs far less than the commercial design. Details of this are given in a separate post on this site. Here’s the Lenham interior roosts. This is what my houses looked like after 8 weeks with no cleaning during the big freeze. After the thaw I thought I'd use my phone camera to take a few snaps of the first cleanout in 8 weeks. 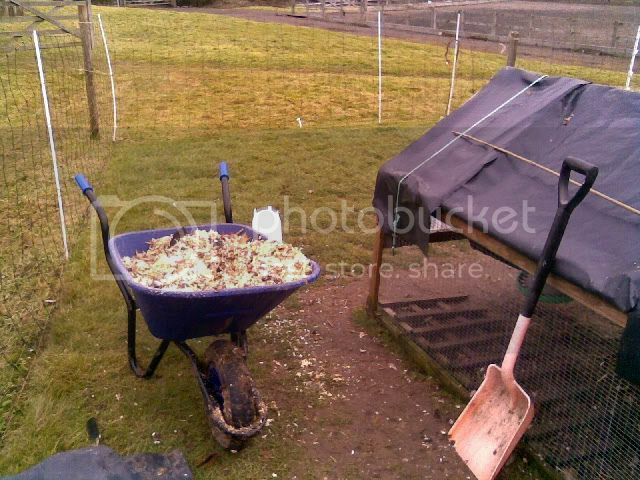 When sufficient litter has been removed the remainder is gather up in the floor poly sheet used as a bag and tipped in the barrow. The occupants are perched on the nestboxes for a grandstand view of proceedings, awaiting an inspection. Here I have lifted off the rear wall too to give you an idea of the access this house has. Any litter dropped can be swept out with nothing to obstruct access. 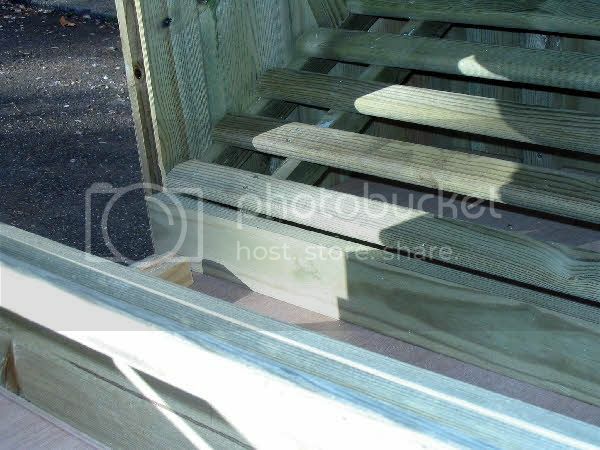 You will note the floor pan and corners as well as the perches have been painted with a diatom slurry which if you are carefull will last at least two clean outs without needing to be redone. Though the roosts get most wear and may need a touch up more often. The diatom not only discourages Red Mite but dries the droppings which tend not to stick as they would to bare wood. 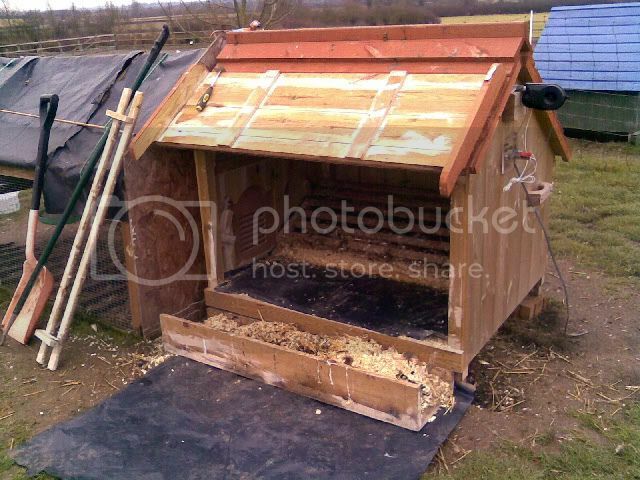 Scrape the roosts and replace all the internal components, a few handfuls of shavings sprinkled thinly on the floor to allow a build up of top dressing, replace the nestbox and you’re done. Just wheel away the spent litter to the compost heap. 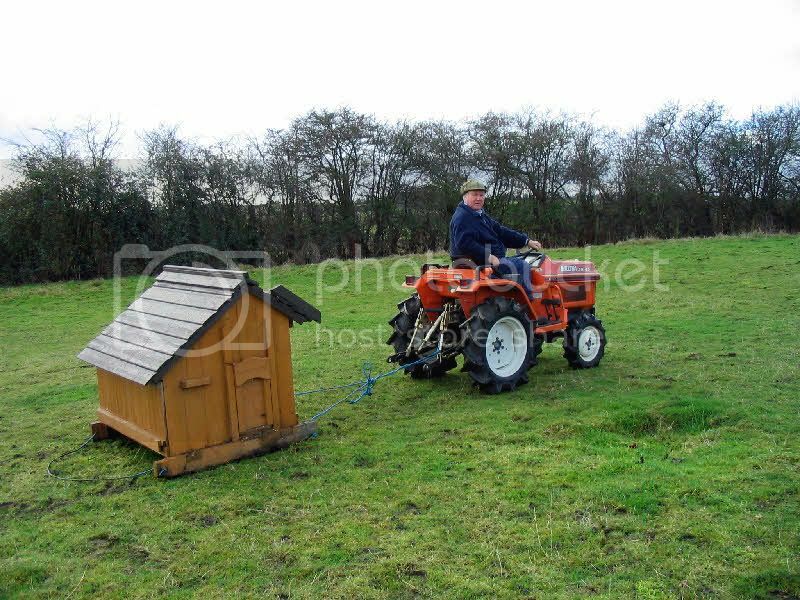 My houses are mounted on sledges to make them easily movable either with two strong people or as here with the tractor if you want a movable run system like mine. The covered porch run on the front of the house I make myself from mesh panels fixed together and that keeps the entrance dry and provides shelter and a place to hang the feed. A floor system with duck mats also separately described on this site keeps mud from being trailed into the house. Part two will show how to clean an eglu in 3 minutes as well . dispatching a chicken part 2 " oven ready "